Update (13 Nov 2014): Relevant to this is a paper that has just been published in which we show how indices of extinction risk can be developed from models of population dynamics. Following some editing, I have turned a previous post about problems with ecological indices into a Decision Point article. In writing that piece, I thought about other science disciplines, and whether they would countenance an approach to developing indices that permits arbitrary combinations of variables. I turned to Newton’s Law of Universal Gravitation, which is an imperfect theory describing the gravitational force between two objects. For example, it under-predicts the degree by which light is bent by gravity. Nonetheless, it can describe planetary motion quite well, and will get you to the moon and back. The gravitational force between two objects depends on their masses and the distance between them. Gravity increases with the masses, and declines with distance. The rate of reduction in gravity with distance becomes less at larger distances. Faced with this information, an ecologist might create an index of gravity that is equal to m1 + m2 – logd, where m1 and m2 are the masses of the two objects, and d is the distance between them. As an index of gravity, it has the same elements as Newton’s Law of Universal Gravitation which states that the force of gravity is proportional to F = m1m2/d2. But this “ecological index of gravity” wouldn’t be much use if you wanted to work out the orbit of planets, how to get a rocket into space, or even how to catch a ball. Which is just a simplified example demonstrating that it’s not enough to just have the right elements in an index. It’s all about how that index relates to the thing you are interested in. Apollo 11 at the launch pad. Previously, I have criticized an index of “habitat quality” partly because elements in the index were added, which implies substitutability of the habitat elements (i.e., a reduction in large trees can be fully compensated by an increase in logs). I suggested that a multiplicative index, which implies imperfect substitutability, would be better. Our critique and suggested modifications was met with the reply “Any mathematical benefit must be weighed against the additional complexity to field staff, and a more sophisticated approach may increase mistakes”. 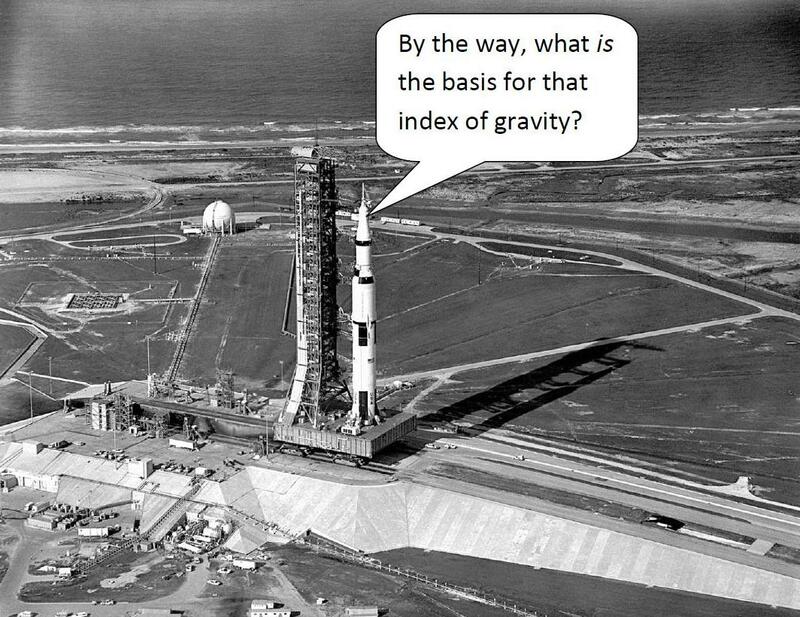 The person sitting in the rocket would be in serious trouble if the force of gravity had been calculated using an additive model. And they would be hoping fervently that concerns about the calculations being too sophisticated hadn’t overridden concerns about getting the basic logic correct. This entry was posted in CEED, Ecological indices, NERP and tagged biodiversity, Ecological indices, ecology, indices. Bookmark the permalink.